Tissue Holding forceps as the name suggests are used to stabilize the Soft Tissue but holding or Grasping it to help prevent any interference by Soft tissues in Surgeries. They are used to hold tissue which is being excised or tissue ends while suturing, and also used to hold/grasp dressings and surgical materials. 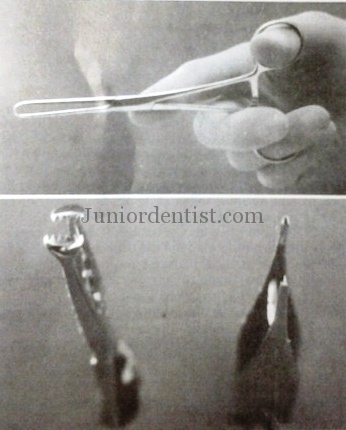 Tissue Holding Forceps have either Teeth in their working end blade or are mostly flat/plane. Tissue holding forceps used in General Surgery are mostly large and used to hold Coarse tissue like Skin, Muscles Tendons etc, but in Dentistry we need delicate types of Tissue holding forceps which can handle Delicate Oral Soft tissues. Plane Tissue Holding Forceps: These are used to hold Delicate Tissue which are injured, and these Plane Forceps have Serrations towards the inner side of the Blade. Toothed Tissue Holding Forceps: These have a Toothed Working Blade which is used to hold resilient structures like Skin, Muscles etc during Suturing or Undermining. This type of Forceps is used to perform Delicate functions like Holding tissue and it is available in 2 types: Toothed and Non-Toothed. Toothed Adsons Tissue Holding forceps have Serrations at the tip of the working end which helps in having a better grip at the tissue. While using this type take care not to hold the tissue toot ight which will crush the tissue between the teeth. Non Toothed Adsons Tissue Holding Forceps has the same structure but without the Serrations on the working end. These are forceps which are 7 to 9 inches in length to reach to the posterior region of the mouth where the Adsons Forceps cannot reach. It has similar function to Adsons forceps and an added advantage of being longer. Stillies Forceps is a longer slender forceps compared to Adsons and used to hold tissue during Suturing in the posterior region of mouth like the 3rd molar region where working with the Adsons forceps can be difficult. It is used to hold onto rough tissues and in larger amounts, like in Excisions and Surgeries where a large amount of Fibrous tissue has to be held and removed. The forceps has a Locking handle which helps in grasping and holding on to the tissue in cases like Epulis Fissuratum where a necessary amount of pressure on the tissue is necessary to pull the tissue and hold it while Excision. It has 5 teeth on each end which interlock together to hold onto tissue. Note: Never use Allis Tissue holding Forceps on Soft tissue which has to be preserved of left in the oral cavity after surgery as it causes gross Destruction or Crushing of the tissue which will not heal properly. These are Forceps which have Large Rounded ends in the working area which is useful in Oral Surgical procedures to hold and pick up teeth which are extracted or elevated from the socket. The large round tip gives more surface area and positive Grip on the tooth fragment which does not let the tooth slip from the instruments. For Placing Gauze in the working area for the Surgeon to work on a certain area of the Oral cavity. 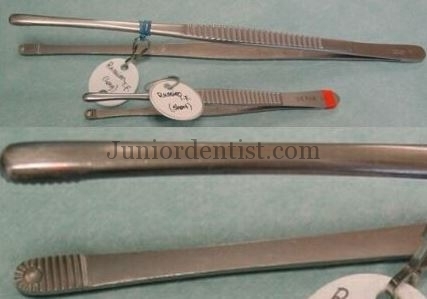 These instruments or the forceps are the best instruments for any dental surgery to take place. The forceps with curves and points are very useful for dental surgery and quite efficient and effective.